Toys, spoons, keys: what DON’T babies put in their mouths? Kleynimals (pronounced “Clean-Ih-Mals”) creator Kirsten Chapman’s son was no exception in his key obsession, but she became concerned after discovering that house and car keys can have dangerous amounts of lead in them. 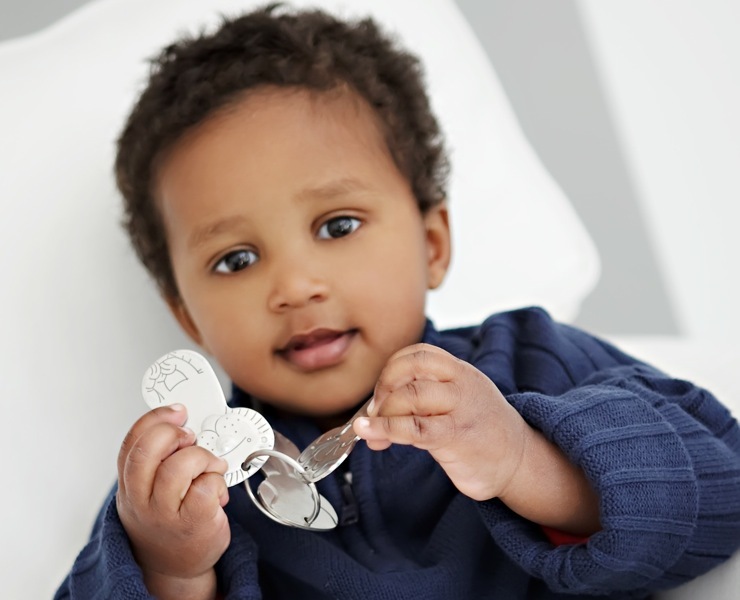 To keep both Mommy and Baby safe and satisfied, she created keys made from 100% food grade stainless steel, which means Kleynimals are easy to clean (even in the dishawasher! ), non-corrosive, and free of lead, phthalates, BPA, and cadmium, so if your baby uses them for teething you don’t have to worry. Made for babies 6 months and up, Kleynimals come in a set of three shapes: a lion, giraffe, and an elephant, and they can be personalized for your little one. Made in the USA and assembled by a non-profit organization that employs adults with developmental disabilities, Kleynimals may hold the key to safely keeping baby’s attention for hours. Toys, spoons, keys: what DON�T babies put in their mouths? Kleynimals (pronounced �Clean-Ih-Mals�) creator Kirsten Chapman�s son was no exception in his key obsession, but she became concerned after discovering that house and car keys can have dangerous amounts of lead in them. To keep both Mommy and Baby safe and satisfied, she created keys made from 100% food grade stainless steel, which means Kleynimals are easy to clean (even in the dishawasher! ), non-corrosive, and free of lead, phthalates, BPA, and cadmium, so if your baby uses them for teething you don't have to worry. Made for babies 6 months and up, Kleynimals come in a set of three shapes: a lion, giraffe, and an elephant, and they can be personalized for your little one. Made in the USA and assembled by a non-profit organization that employs adults with developmental disabilities, Kleynimals may hold the key to safely keeping baby�s attention for hours.